I spent a long time thinking about my title, above. These ARE reviews of picture books in that they all have pictures. All of them are illustrated by people whose art has contributed to comics and graphic novels. They are all aimed at kids, but can most certainly be appreciated by teens and adults. They are all exciting because of what they offer to children: their energy, humour and readability. Yet their formats are not identical. GraphicPicture Books sums them up for me. The Princess and the Pony: Written and illustrated by Kate Beaton, and published by Walker Books (2015), The Princess and the Pony can also be found in my list of Bookish Christmas Gift Suggestions for Kids. Princess Pinecone knows exactly what she wants for her birthday this year. Not a cosy sweater like always, but a horse: a big horse, a strong horse, a horse fit for a Warrior Princess! But when the day arrives, Pinecone doesn't quite get the horse of her dreams... Brave Viking warriors and big surprises abound in this laugh-out-loud title. If anyone had told me I would fall for a farting pony, I would have given them my famous raised eyebrows over-the-spectacles look. But it’s definitely the pony in this children’s picture book that has prompted me to fandom. I’ve even sent out hints about the pony plush, available via Beaton’s store. Is it the big eyes, the roly-poly tummy, those dinky little legs? Is it that the pony, despite obvious disadvantages, cheerfully tries to be a warrior’s mount? Or is it the end papers that won me over, with rows of ponies modelling cosy sweaters? Beaton’s webcomic Hark! A Vagrant is well-known and loved by many. It’s not for kids though. Instead they have the joy of discovering this delightful children’s picture book. Despite the flatulence, (or maybe because of it?) I think your kids will love The Princess and the Pony for its great artwork, it’s humour, its feisty heroine and above all its very, very cute pony. The Princess and the Pony looks a lot like other 32 page picture books, and has none of the visual elements we tend to expect from formats closer to the comic e.g. no speech bubbles and panels. It’s perfect for sharing with young warriors or suggesting to kids who think humour and coolness is only found in cartoons. Little Robot: Written and illustrated by Ben Hatke, Little Robot was published by First Second (2015). I have previously reviewed Hatke’s Legends of Zita the Space Girl and Julia’s House for Lost Creatures. When a little girl finds an adorable robot in the woods, she presses a button and accidentally activates him for the first time. Now, she finally has a friend. But the big, bad robots are coming to collect the little guy for nefarious purposes, and it's all up to a five-year-old armed only with a wrench and a fierce loyalty to her mechanical friend to save the day! #1 New York Times Bestselling author Ben Hatke brings his signature sweetness to a simple, moving story about friendship and overcoming fears that will appeal to readers of all ages. Our young explorer and heroine encounters a box that has fallen off the back of a truck. Inside is a little robot. She introduces the little robot to her neighbourhood, and to the joys of skipping stones, playing tag and wandering freely. But an evil machine has been despatched to recover the robot and soon the two have trouble on their hands. Does the little girl have the necessary courage and resilience to overcome the bad guy and save her friend? Kids who are not yet sure they love to read might well be lured by the amount of text in Little Robot. The opening section is wordless, yet shows a clear narrative. Much of the book relies again on panels that are purely visual, but that kids will have no trouble understanding. There are 131 pages divided into seven chapters in this sturdy hardback, making it a satisfying chunk of story, without being dauntingly packed with text. Hatke’s art work is brilliant as ever, with much colour, expression and movement. Check out several pages at Macmillan’s website. Not a standard picture book the way The Princess and the Pony is, I would classify Little Robot as a graphic novel. I hope you’ll seek it out for your library or home, and make visually appreciative kids very happy. Dragons Beware! by Jorge Aguirre and Rafael Rosado, was published by First Second (2015). It’s the second book in the Chronicles of Claudette. I loved Dragons Beware! and chuckled my way throughout. Aguirre’s art work is stunning - the characters expressions’ are priceless and will contribute much to children’s comprehension of the storyline. Do grab it soon and let me know if you enjoy it as much as I did! Children can learn so much about visual literacy from picture books, comics and graphic novels. Much they will pick up over time and repeated reading and sharing. But parents and teachers can help by asking questions that prompt responses. For instance: I wonder why the boy has a crinkly line where his mouth should be. How do you think he feels? OR Which way is the cloud moving? How does the artist show us that? OR Why do you think the battle scene covers a double page? What does that make us feel? 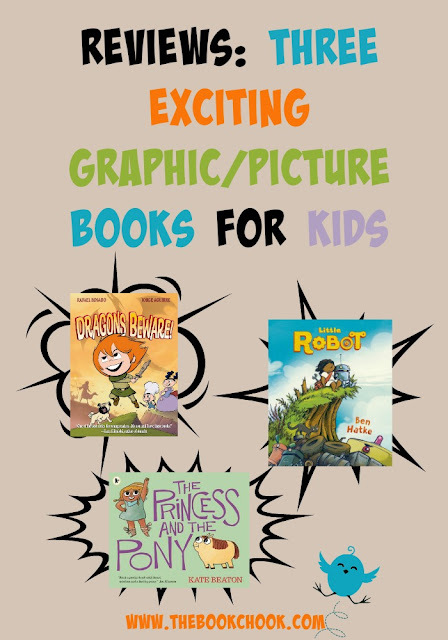 If you’re a librarian looking to augment your graphic book collection, I recommend the three above.